Buy Hawthorn Hedging Tree (Crataegus monogyna) online from UK tree supplier of cell grown broadleaf hedges and shrubs. 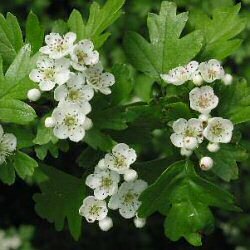 Hawthorn (Crataegus monogyna) aka Quick Thorn or May Thorn, is probably the most common native, British hedging species. It does particularly well in most soils, except very wet soils and equally copes with all sites with the exception of dense shade. Hawthorn is fairly fast-growing, adding approximately 45cm (1ft 6in) of new growth in a year. During Spring, hawthorn comes into leaf, followed shortly afterwards by a attractive display of white scented blossom. In Autumn, amazing displays of red-berries appear which are a valuable food source to many forms of wildlife. The dense thorns make some bird species feel safe enough to build nests within the Hawthorn hedge so expect a great deal of wildlife activity if you plant these. Hawthorn is considered the second most useful plant for UK wildlife beaten only by English Oak. Suitable for coastal hedges which means gardens that ARE CLOSE TO SEA WATER, not sand dunes, salt marshes and Royal Navy artillery ranges! We do get asked these things! Hawthorn Hedging is suitable for exposed sites which means will tolerate windy and harsh weather conditions and not nudist colonies. We recommend trimming shortly after flowering or in Autumn. Hawthorn is quite often found as one of a number of native species in a hedging mix, these typically including; Blackthorn, Hazel , Dog Rose , Elder and Crab Apple , but there is no reason why it cannot be planted as a pure Hawthorn hedge. Our Hawthorn hedging trees are sold as plug plants, in other words the roots are encased in compost. This means that planting can be carried out at any time of the year, provided they are watered in periods of drought, compared to bare-root plants which can only be planted during the plants normal dormant period (November to March). All of these trees are UK grown, which is important for successful establishment. How many Hawthorn hedging trees do I need? March 2013: Hi Alan, Thank you for your amusing email. Have received the aforesaid item and have immediately potted into a pot ready for the spring but who knows if it will grow in this totally sunless climate we are currently experiencing. However I have purchased a tulip tree from you a couple of years ago and its doing fine! Many thanks Martin daggett.